Being able to gauge the size of things without having to perform tedious and difficult calculations is an extremely useful skill to have, and none was better at it than the Italian physicist Enrico Fermi (1901-1954). He is particularly famous for a (grim) feat of estimation performed in the early morning of 16 July 1945 in a New Mexico desert. Along with other physicists Fermi was watching the detonation of the first ever atomic bomb, from a safe distance. Nobody could predict just what they were about to witness, but as others stood dumb struck by the apocalyptic fireball, Fermi dropped a hand-full of little paper strips. By measuring how much the strips were displaced by the air blast from the explosion, he estimated its strength as being equivalent to 10,000 tons of TNT. His guess was out by only a factor of two: the actual value registered by the measuring instruments was 20,000 tons. What is the population of Chicago? How many families does that correspond to? 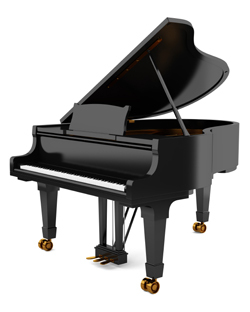 What proportion of families have pianos? How many times a year is a piano tuned on average? How many tunings can a tuner make a year on average? A quick web search gives the population of Chicago as 2.7 million. Assuming there are around 4 people in an average family gives 675,000 families. From experience you might judge that one family in twenty has a working piano, giving 33,750 pianos. If each needs to be tuned once a year that makes 33,750 tunings per year. Suppose a piano tuner can manage four pianos a day (seems reasonable), making 4x5 = 20 a week, during 50 weeks of the year. That makes 20 x 50 = 1000 tunings per tuner a year. Assuming that there are as many tuners as there is demand for, this gives an estimate of 33,750/1000 = 33.75 piano tuners in Chicago. This answer is not going to be exact, but the point is that in a few simple steps you can at least get a grip on the expected order of magnitude of things. Unless your assumptions are completely out, you can be pretty sure that the number of piano tuners is somewhere over 10 and less than 100. Plus, you can easily repeat the calculation with new values for your assumptions if new information comes to light, or add additional assumptions into your line of thinking. For scientists Fermi estimation is a useful tool. It gives you a way of guessing what the outcome of an experiment, or measurement, or opinion poll, or study is likely to be. If it turns out to be very different, then that’s a sign that either something went horribly wrong with your experiment or that you haven’t got a full grasp of what’s involved. Both things are worth knowing. Some argue that even the general public should have a good grip on Fermi estimation, as it would give people a way of separating the mass of information that is thrown at them every day into fact and fiction. Perhaps the art of guessing will one day find its way onto the school curriculum. This is one of the fascinating stories that didn't make it into our upcoming book, Numericon: a journey through the hidden lives of numbers, published on September 4!